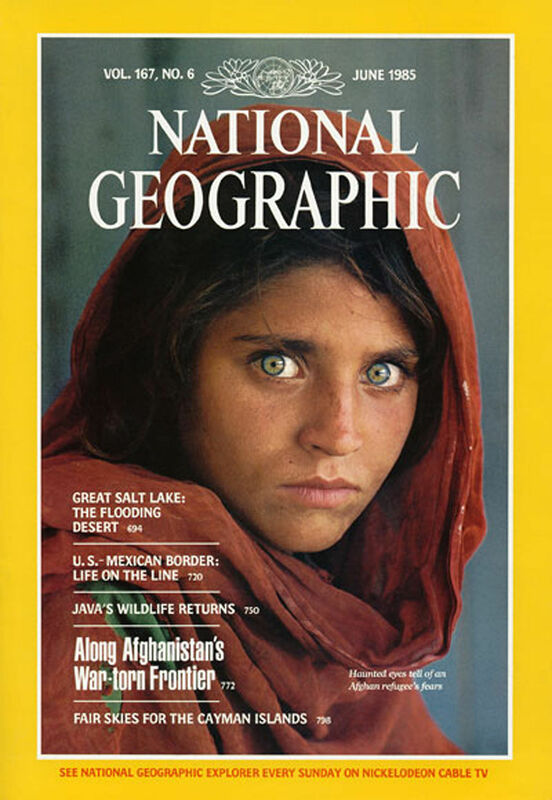 PESHAWAR (Pakistan) • An Afghan woman immortalised on a celebrated National Geographic magazine cover as a green-eyed 12-year-old girl was arrested yesterday for living in Pakistan on fraudulent identity papers. The haunting image of Sharbat Gula, taken in a Pakistan refugee camp by photographer Steve McCurry in the 1980s, became the most famous cover image in the magazine's history. She now faces up to 14 years in jail - in an episode which highlights the desperate measures many Afghans are willing to take to avoid returning to their war-torn homeland as Pakistan cracks down on undocumented foreigners. Pakistan's Federal Investigation Agency (FIA) arrested Gula for fraud following a two-year investigation in the north-western city of Peshawar, the capital of the restive Khyber Pakhtunkhwa province bordering Afghanistan. "FIA arrested Sharbat Gula, an Afghan woman, for obtaining a fake ID card," Mr Shahid Ilyas, an official of the National Database Registration Authority (Nadra), told Agence France-Presse. He said the authorities were seeking three Nadra officials found responsible for issuing Pakistan's national identity card to Gula, who have been at large since the fraud was detected. He said Gula faces seven to 14 years in prison and a fine of US$3,000 (S$4,200) to US$5,000 if convicted. Officials say Gula applied for a Pakistani identity card in Peshawar in April 2014, using the name Sharbat Bibi. She was one of thousands of Afghan refugees who managed to dodge Pakistan's computerised system to get an identity card. The original image of Gula was taken in 1984 in a refugee camp in north-west Pakistan during the Soviet occupation of Afghanistan. Mr McCurry tracked her down in 2002, after a 17-year search, to a remote Afghan village where she was married to a baker and was the mother of three daughters. Sharbat Gula now faces up to 14 years in jail - in an episode which highlights the desperate measures many Afghans are willing to take to avoid returning to their war-torn homeland. Pakistan has for decades provided safe haven for millions of Afghans who fled their country after the Soviet invasion of 1979. It hosts 1.4 million registered Afghan refugees, according to UNHCR, making it the third-largest refugee-hosting nation in the world. The agency also estimates a further one million unregistered refugees in the country. Since 2009, Islamabad has repeatedly pushed back a deadline for them to return, but fears are growing that the latest cutoff date in March next year will be final. Meanwhile, the refugees are increasingly worried about their future in Pakistan as the country cracks down on those who have obtained fake ID cards. Officials say Nadra has so far reverified 91 million ID cards and detected 60,675 fraudulent ones.